CSA #1 singles on cover postmarked NEW ORLEANS, LA, 23 JAN, sent to Lewis Thompson, Hotel, Bertie County, NC. 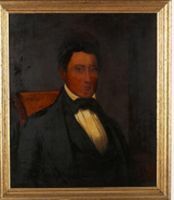 Lewis Thompson, a successful businessman, owned plantations near Woodville (also called Hotel), Bertie County, North Carolina and in Rapides Parish, Louisiana. Lewis was also a political leader in North Carolina, serving in the House of Commons and the State Senate, 1831-1852, and as a member of the General Convention of 1865.